Part of the Product Design course curriculum is DEPD 1110-Visualization for Product Design, taught by Mr. Matthew Chan. We are working on developing fundamental skills in visualization; through sketching, drawing and rendering. We are learning how important being able to translate your ideas into drawings or models and it is a very effective way to communicate. Each week we are required to draw and colour five or more drawings. We work on the skills we read about in our textbooks (Rapid Viz & Sketching) and take direction from student and teacher critiques. To read the full course description, please go to http://www.kwantlen.ca/calendar/2012-13/courses/depd/index.html#depd1110 . The weekly drawing assignments are handed in three times during the semester, you can see below for what I am submitting today. Week 1- We were asked to draw to showcase our abilities and style. I chose to draw objects that interest me. In keeping with the objective of drawing five days a week, we were asked to date each drawing. 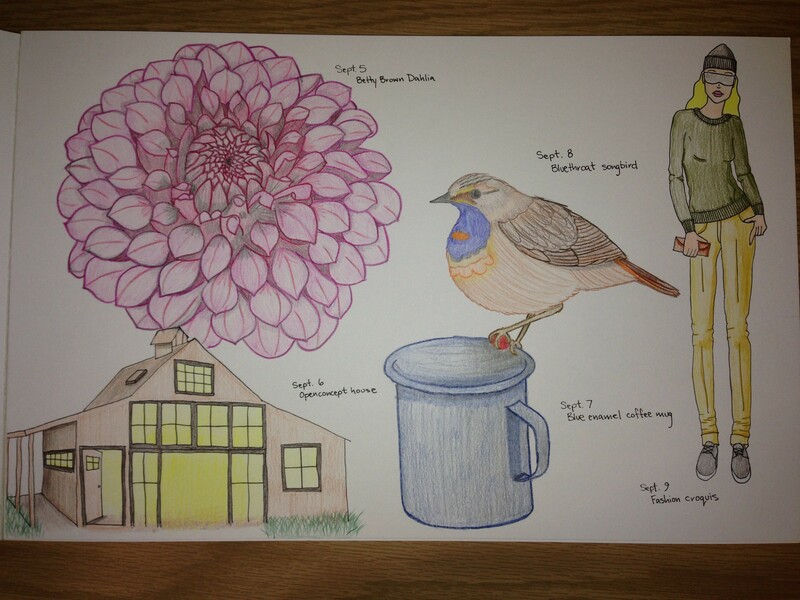 My first drawing was of a Betty Brown dahlia on September 5. The following day, I drew an open concept house from a travel magazine. On September 7th, I drew a blue enamel coffee cup from a website. My fourth drawing is of a Bluethroat songbird, drawn from a book. And on September 9, I drew a croquis (in fashion, “croquis” refers to a quick sketch of a figure) This one is “nine heads tall”, the accepted proportion for fashion illustration. 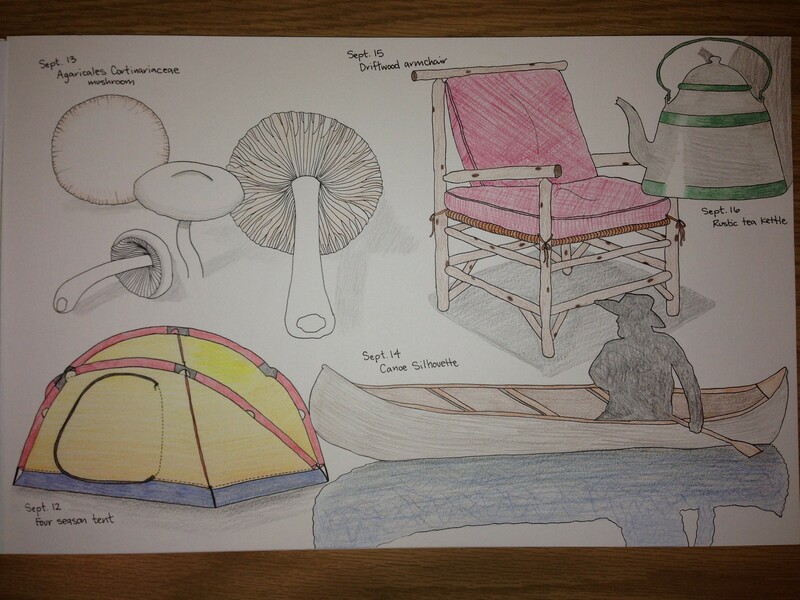 Week 2 – My first drawing this week was of a four season camping tent on September 12. The next day, I drew multiple angles of Agricales Cortinariaceae mushrooms from an identification book. On September 14th, I sketched a wooden canoe with the silhouette of a man. My fourth drawing is of a driftwood armchair, that is at my friend’s house. I finished the weeks drawings with an old style of tea kettle seen on the internet. 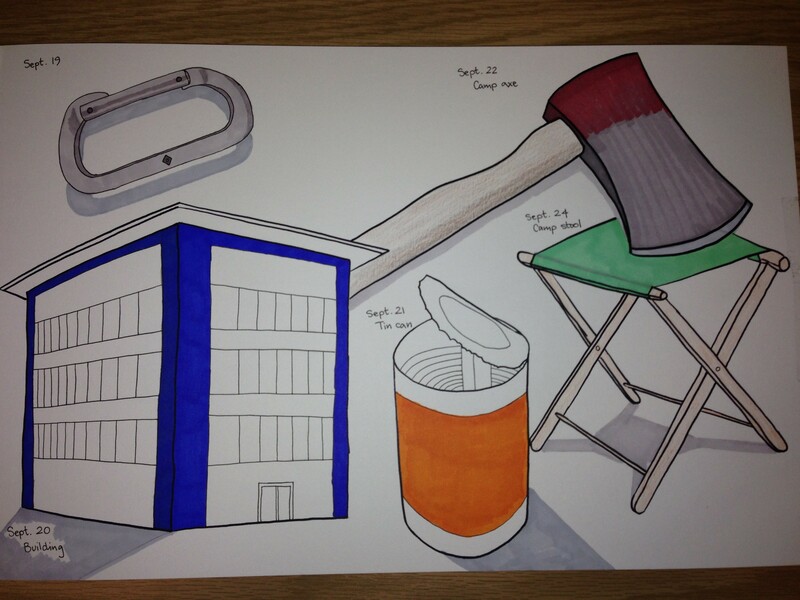 Week 3 – This week I tried using Prisma Markers for the first time ever. I’m intimidated by markers because they are so saturated and permanent, so I usually use pencil crayon. Time to step out of my comfy cozy box!! On September 19th, I drew my Black Diamond carabiner. I achieved the shadow by holding it slightly above the table. My next attempt at drawing a building was on September 20th, I feel like it’s not quite right (but neither am I! muahahahaaa). I dug around in the recycling bin and drew a partly opened tin can the following day. In an attempt to draw more real life objects (versus drawing from a book) I drew my camp axe. Last night (September 24th) I drew a camp stool, but I couldn’t find mine so I drew this from a catalogue. If you have any suggestions or critiques, I would be happy to receive them. Thank you for reading!